The Men's Interstate Championships were conducted at Bundaberg for the first time and it was the 50th anniversary of the first King's Cup back in 1919. The format of heats, repechages and finals was again used. 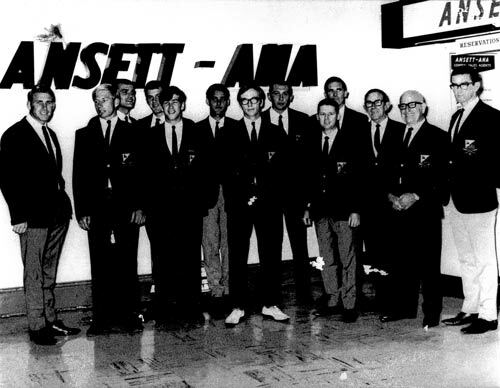 Left to right: D Lewis (4), P Healey (str), H Formby (6), P LeSouef (Emerg), C Poyton (bow), M McHenry (7), M Harrison (Emg), S Omadei (3), T Scook (cox), A Grey (5), R Gard (coach), G Giles (manager), R Fitzharding (2). It was a fast start from all crews but Victoria soon gained the lead and was never headed. At the 500 metre mark Victoria gained a 3/4 length lead and held that lead through the 1000 metre mark. The lead increased to one length by the 1500 metre mark and this was maintained to the end. E1: 1st TAS, 2nd QLD, NSW disqualified due to an underweight cox but permitted to race in repechage. The final was close between NSW and TAS, with SA finishing 5.9 seconds further back in third place and Victoria a further 17.8 seconds back in last place. Victoria won its first victory for 29 years in this Championship, winning by 3/4 length to NSW. The Victorian crew all hailed from the then dominate Victorian women's club of YWCA. The emergency was the exception who came from the Preston club. The Sculling Championship was an easy win to Janis Adam of NSW. Janis went onto win again in 1970 under the coaching of Steve Roll. 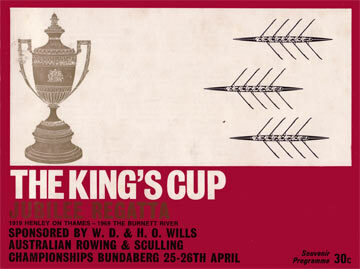 The Lightweight Four Championship was a good race also with NSW taking the Championship from VIC by 3/4 length. The Queensland crew thought seriously about scratching from this event as three of the crew also were racing in the Fours Championship.